When I was in Sweden in 2011 I visited a little place called Gilda’s Café and had what was essentially a bowl of hot chocolate (!) and a slice of the most amazing blueberry pie I’d ever tried, so many blueberries on one slice of pie. Ever since I’ve thought about that pie and how to try to re-create it. 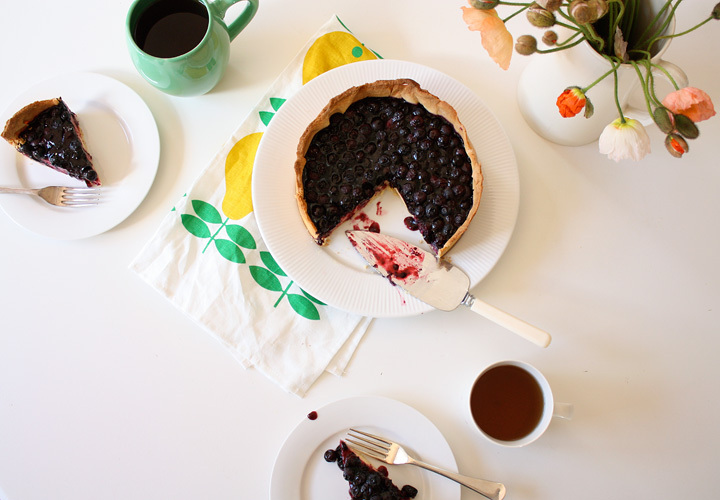 By chance I have been going through the many cook books I have at home lately and stumbled across a blueberry lemon tart recipe in Breakfast Lunch Tea by the Rose Bakery. It looked a little like it might produce something like the one from Gilda’s. 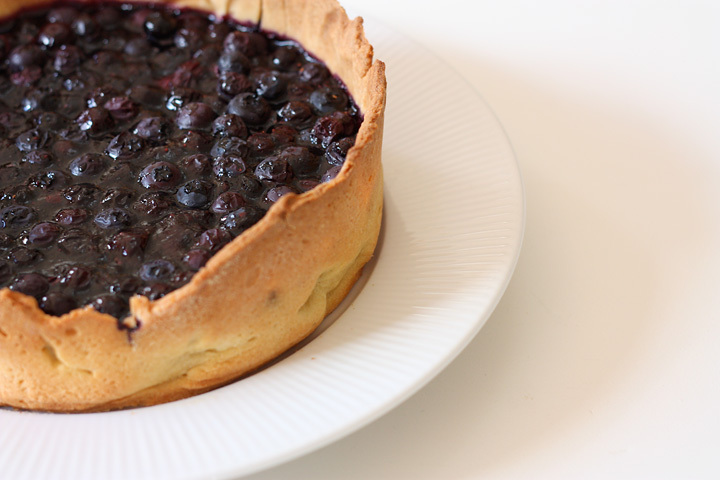 So a few Saturday’s ago I brought some local blueberries at Salamanca market and baked this tart. It is very very good. In a bowl add the flour and sugar and rub the butter into the mix until it resembles fine breadcrumbs. Make a well and add the eggs, yolk and vanilla, stir with a fork until it forms a dough and then placed on a floured surface and knead until it is smooth. Roll out the dough and fit into a greased tin. Chill in the fridge for 30 minutes. Then place some baking paper or foil over the top and cover with baking beads, or rice or dried beans or whatever you have. Bake in a preheated over at 180 Celsius for 20 minutes. Leave to cool. (I halved the quantities in the book for the smaller tin and because I didn’t have a lot of eggs – if you use a bigger tin double these quantities). Whisk the lemon juice and sugar in a bowl and then beat in the eggs and egg yolks one at a time. Add the cream and whisk it in followed by the flour. Pour the mixture into the tart pastry and bake at 180 for approximately 30 minutes and allow to cool before adding the blueberry topping. Heat the jam in a saucepan until it is simmering and bubbling a little then add the fresh blueberries and stir through. Allow them to cook 4 to 5 minutes, stirring occasionally. Then take off the heat and pour over your tart. Allow the blueberries to set before eating (takes maybe 20 minutes).